School Library Journal School Library Journal | Real-Life Drama: Kate Messner on Her New Novel, "Breakout" School Library Journal | Real-Life Drama: Kate Messner on Her New Novel, "Breakout"
Kate Messner, author of more than 30 books, including The Exact Location of Home, The Seventh Wish, and the "Ranger in Time" and "Marty McGuire" series, as well as numerous picture books and works of nonfiction, has a new middle grade novel out this June, Breakout, which recently earned an SLJ star. The story takes place in a small town in upstate New York, where a recent prison break reveals sharp tensions in the tight-knit community. We recently caught up with Messner to get the story behind the story. What inspired Breakout? 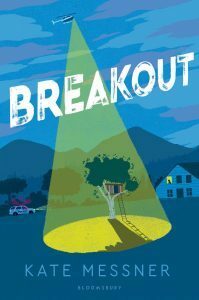 Breakout is a fictional story, but it was very much inspired by the real-life prison break at Northern New York’s Clinton Correctional Facility in June of 2015, when two convicted murderers carried out an elaborate escape plot that launched a 23-day manhunt. That prison is 14 miles from my house, so, like everyone in the region, we were checking the locks on our doors and windows and listening as police helicopters circled each night. But unlike most of my neighbors, I’m a former journalist, so my uneasiness was mixed with a healthy dose of curiosity. On the second or third day of the manhunt, I was chatting online with a college friend who asked if I was missing journalism, given all the excitement, and I confessed that I was indeed envious of the reporters who were covering the story. He said, “So why don’t you take your notebook and go out to the prison? Do you have to be somewhere else today?” I didn’t—and so I drove through the police roadblocks to the prison and settled in at a little coffee shop across the street from the correctional facility. It was mobbed, and everyone who came through the door had a story. So for the better part of three days, I sat at a table and talked with people and listened to their stories. There were police officers who would come in covered in mud and ticks after a morning out searching the woods. There were families who lived near the prison—parents who whispered to one another about how their kids were afraid to go to sleep at night. One little boy came in wearing his Halloween firefighter costume and an enormous pair of tall rubber boots. He was hoping he’d be invited out to help with the search. And there were also family members of inmates who had been hoping to visit. They’d been told that visiting hours wouldn’t happen for a long time because the prison was on lockdown, and they shared how worried they were for their loved ones who were waiting out the manhunt inside the wall. Little by little, as I talked with people, a story took hold in my imagination, and I started writing. By the time the real-life manhunt ended three weeks later, I was about 50 pages into the book that would become Breakout. It’s rare to find a middle grade novel that deals so explicitly with issues of criminal justice, with a sharp focus on race and privilege. What was your process for making these issues manageable for a middle grade audience? I live in a region of New York State that has a great deal of natural beauty but also a noticeable lack of diversity, so the conversations surrounding racism and social justice that happen in more diverse communities aren’t as common here. I wanted to explore what happened when a series of events in a similar community suddenly forced those issues into the light. My 15 years of experience as a middle school teacher helped immensely as I was working on the voices in this book. I taught seventh grade English and had so many thoughtful conversations with my students as we shared novels and stories and articles about current events that dealt with race and privilege and social justice, both historically and today. Kids are so much more open to these discussions than many adults, and I really believe they’re hardwired for empathy. They want to make a difference and make things better. I’d be remiss if I didn’t also share that I had a lot of help in working through these issues in the book, which is told in multiple points of view. One of the main characters, Nora, is a white prison superintendent’s daughter and shares a small-town background that’s very similar to my own, so her story was the one that came most naturally for me as a writer. Another character, Elidee, is an African American girl who’s just moved from the Bronx to this small town where her brother is an inmate in the prison. Writing her letters and poems required a lot more research, reflection, and revision. As a white writer, I’ve never experienced the daily microaggressions she faces, and I’m grateful to the many early readers who pushed me to do better with Elidee’s story, to do more research and reading and make sure her voice was as authentic and honest as it could possibly be. Did you work with sensitivity readers? If so, how did that experience aid this process, particularly in the portrayal of Elidee? Yes, and this was essential. I couldn’t have written this book without help from readers who offered feedback throughout the process of writing and revising Breakout. These included friends and critique partners who share elements of Elidee’s background as well as professional sensitivity readers. They asked invaluable questions and helped me see areas where my understanding was lacking in early drafts. One example was in the portrayal of Elidee’s relationship with her mother. One of my earliest readers talked with me at length about the specific conversations black parents are forced to have with their children to keep them safe—conversations that white parents don’t need to have—and pushed me to think more about how Elidee’s mom would have prepared her for their move to Wolf Creek, a town where she knew her daughter would be one of very few brown faces at school. Another reader pushed me to do more with Elidee’s background. What specific things would she be missing most from her life in the Bronx? I realized that I couldn’t answer that question, so I talked with more people who lived in neighborhood’s like Elidee’s, and I scheduled a trip to New York so that I could spend a day in Elidee’s old neighborhood, Highbridge, which is very close to Yankee Stadium. I talked with people and went to the art museum and visited the bodegas and parks that would have been part of her world before she moved, and then I had a much stronger sense of what she’d lost by moving to Wolf Creek. How did your work as a middle school English teacher influence the format of the book? I’ve always been fascinated by novels with multiple points of view because I think truly working to understand different perspectives is an essential skill for both readers and citizens. One of the books I shared with my seventh graders was Paul Fleischman’s Seedfolks, which is a collection of diverse voices and stories that surround a community garden. More recent titles with multiple points of view do even more to explore issues of privilege and perspective—books like Two Naomis and Naomis Too by Olugbemisola Rhuday-Perkovich and Audrey Vernick, All American Boys by Jason Reynolds and Brendan Kiely, and Jazz Owls: A Novel of the Zoot Suit Riots by Margarita Engle. Sharing novels with multiple points of view with kids really made me a believer in the power of these kinds of stories to build empathy and understanding. Breakout includes references to the work of Jacqueline Woodson, Lin-Manuel Miranda, and Nikki Grimes. Why did you choose these artists as inspirations for Elidee? How has their work inspired or influenced your own? As a former teacher, I’ve seen the power of mentor texts in helping students to find their own voices, so using models from poets like Woodson, Grimes, and Miranda felt like a perfect way to help Elidee explore the feelings she’d been holding inside. I chose these writers in particular because I thought their work would speak to Elidee the most. I’ve talked with so many kids who feel empowered by the work of Grimes and Woodson, and Woodson’s Brown Girl Dreaming includes a poem about driving upstate to visit the prison in Dannemora, which I knew would resonate with Elidee in a very personal way. I also had the opportunity to see Hamilton while I was working on this book, and when I was listening to Miranda sing “Hurricane,” I kept thinking about what Elidee would take from those lyrics. “I wrote my way out…” would take on so much meaning for a kid whose brother was in prison working on an appeal. And might it also make her wonder if she could write her way out of this small town where she never wanted to move? That idea was one that I knew I wanted to explore, so I brought Elidee to Wolf Creek just a couple of weeks after she’d seen Hamilton with her drama club group from school. She uses Miranda’s lyrics as mentor texts, writing rap battles between the school principal and the student council in the style of Hamilton’s Cabinet battles, and ultimately, she borrows the structure of songs like “History Has Its Eyes on You” and “Alexander Hamilton” to explore her own identity and find her voice. You’ve written such a broad range of books for children—easy readers, picture books, nonfiction, chapter book series, and middle grade novels. How does Breakout fit into your growing body of work? I really do write all over the place, and that’s one of my favorite things about making books for kids. It offers me the opportunity to explore so many worlds. But I do think there’s a common theme that runs through my work, and that’s curiosity—whether I’m writing about the subnivean zone under the snow or a search-and-rescue dog in the middle of Hurricane Katrina or three kids swept up in a prison break and manhunt. In the case of Breakout, that curiosity was about exploring all the different perspectives and points of view through the various documents. I’m fascinated by the idea that two people can be in the same room, see the same event transpire, hear the same conversation, and come away from it with completely different interpretations of what’s just happened. I think kids have that innate curiosity, too, not just about things like science and history but also about people. They’re genuinely interested in talking about big ideas and exploring new points of view, and that gives me so much hope for our future. 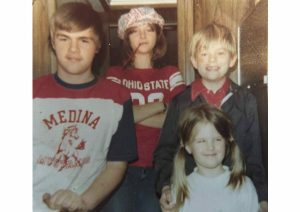 A young Kate Messner, bottom right. Photo courtesy of author. What were you like as a middle grade reader? Did you have favorite authors or titles? I was a voracious reader as soon as I learned to read on my own, which took entirely too long if you ask three-year-old me. I was the youngest of four kids growing up, and when I was little, it felt terribly unfair to me that the older kids could read all by themselves anytime they wanted a story. Once I did learn to read on my own, I don’t think I ever took it for granted. My parents were both educators, and they supported my reading habit with new books, trips to the library, and plenty of time to get lost in stories. My favorite authors growing up were Beverly Cleary, because Ramona felt so wonderfully familiar to me, and Judy Blume, because her characters felt that way, too, but she also made me think about ideas that were new and sometimes uncomfortable to talk about. I still love that about novels—how they quietly push us out of our comfort zones to think about new ideas and stretch our notions of who we might be and how we fit into the world. Here's a photo from my childhood. I’m the little one who’s busy looking at something more interesting than the photographer. 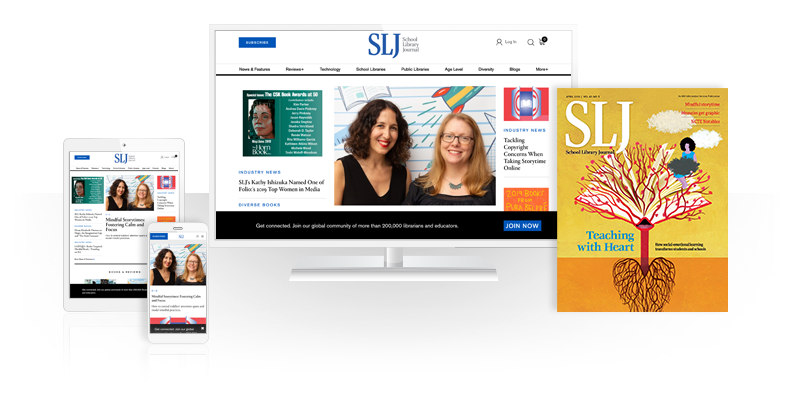 Lisa Goldstein is the Division Chief of the Youth Wing at Brooklyn Public Library's Central Library and a longtime SLJ reviewer. 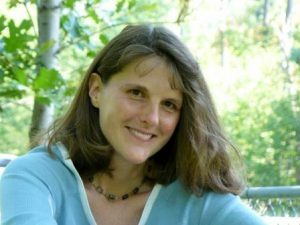 Kiera Parrott is the reviews director for SLJ and LJ.